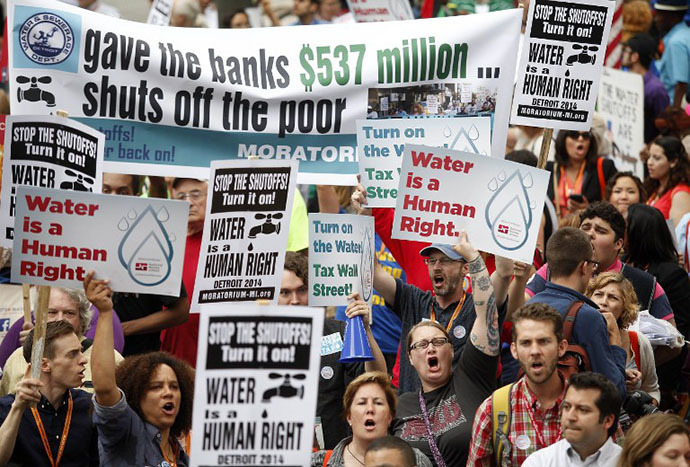 A delegation from the United Nations has completed a fact-finding mission to the U.S. city of Detroit, which is currently experiencing large-scale water disconnections, with at least 27,000 households having their water services cut off this year. The UN delegation, consisting of the Special Rapporteur on housing, Leilani Farha, and the Special Rapporteur on the human right to safe drinking water and sanitation, Catarina de Albuquerque, visited Detroit from Oct. 18-20 on the invitation of U.S. civil society groups. Noting that 40.7 percent of Detroit’s population live below the poverty level and about 80 percent of the population are African American, the experts said that the water shutoffs disproportionately affect vulnerable people and low-income African Americans. The experts also reminded the United States that it is bound by international human rights law and principles, “including the right to life as well as the right to non-discrimination with respect to housing, water and sanitation and the highest attainable standard of health.” These obligations not only apply to the federal government, but to state and municipal governments as well, including the judiciary. “We were shocked, impressed by the proportions of the disconnections and by the way that it is affecting the weakest, the poorest and the most vulnerable,” said de Albuquerque at a press conference on Monday. Similarly, the human right to adequate housing means that housing must be affordable, including the costs of water, sanitation and other housing-related services. Houses without water and sanitation are unsafe and uninhabitable. They expose residents to disease, exacerbate existing health conditions, and threaten the security of tenure of residents. If costs associated with housing are not in line with income levels, housing is rendered unaffordable for many low-income residents, leading to accumulated arrears which in turn create real risks for foreclosure, eviction and homelessness. This contravenes the State’s obligation to ensure tenants and owners enjoy secure tenure. Further, the U.S. should adopt, at all levels of government, a mandatory affordability threshold and specific policies should be adopted to ensure specific support to people who live in poverty. In addition, the federal government should immediately undertake an investigation into the water shutoffs to determine if they are having a disproportionate impact on African Americans and other groups protected against discrimination. For the full statement and list of recommendations, visit the UN’s Office of the High Commissioner on Human Rights web page. Testimonies from residents of Detroit coping with the effects of the water shutoffs are available here. With recent reports indicating that the Obama administration may be maintaining the legal arguments of the previous administration as they pertain to the applicability of international law in counterterrorism operations overseas, as well as leaked news of the much-touted Senate CIA torture report avoiding the assignment of responsibility for these policies, it is growing increasingly obvious that impunity for torture has become undisputed official U.S. policy. When the Bush administration revealed in 2005 that it was secretly interpreting a treaty ban on “cruel, inhuman or degrading treatment” as not applying to C.I.A. and military prisons overseas, Barack Obama, then a newly elected Democratic senator from Illinois, joined in a bipartisan protest. Mr. Obama supported legislation to make it clear that American officials were legally barred from using cruelty anywhere in the world. And in a Senate speech, he said enacting such a statute “acknowledges and confirms existing obligations” under the treaty, the United Nations Convention Against Torture. But the Obama administration has never officially declared its position on the treaty, and now, President Obama’s legal team is debating whether to back away from his earlier view. It is considering reaffirming the Bush administration’s position that the treaty imposes no legal obligation on the United States to bar cruelty outside its borders, according to officials who discussed the deliberations on the condition of anonymity. 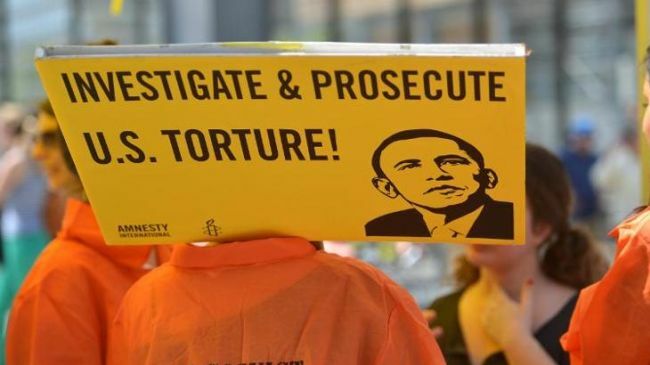 If Obama does decide to continue the policy of denying the Convention Against Torture’s jurisdiction in overseas operations, the message to the world will be received loud and clear that U.S. torturers are indeed above the law – that indeed no legal constraints exist on the U.S. global war on terror, neither its military operations that respect no nation’s sovereignty, its secret black site prisons nor its grotesque regime of enforced disappearances and torture. While some might argue that it’s unfair to jump to conclusions and important to give Obama the benefit of the doubt until a final decision is made as to whether the treaty is legally binding on the United States regarding human rights obligations, in fact there is little reason to offer such latitude. After all, the Obama administration has already declared that another landmark human rights accord – the International Covenant on Civil and Political Rights – has no bearing on U.S. overseas operations, drawing a stinging rebuke earlier this year from the UN Human Rights Committee, which monitors compliance with the ICCPR. The Committee regrets that the State party [the United States] continues to maintain the position that the Covenant does not apply with respect to individuals under its jurisdiction, but outside its territory, despite the interpretation to the contrary of article 2, paragraph 1, supported by the Committee’s established jurisprudence, the jurisprudence of the International Court of Justice and State practice. The Committee further notes that the State party has only limited avenues to ensure that state and local governments respect and implement the Covenant, and that its provisions have been declared to be non-self-executing at the time of ratification. Taken together, these elements considerably limit the legal reach and practical relevance of the Covenant (art. 2). The Committee is concerned at the limited number of investigations, prosecutions and convictions of members of the Armed Forces and other agents of the United States Government, including private contractors, for unlawful killings during its international operations, and the use of torture or other cruel, inhuman or degrading treatment or punishment of detainees in United States custody, including outside its territory, as part of the so-called “enhanced interrogation techniques”. While welcoming Presidential Executive Order 13491 of 22 January 2009 terminating the programme of secret detention and interrogation operated by the Central Intelligence Agency (CIA), the Committee notes with concern that all reported investigations into enforced disappearances, torture and other cruel, inhuman or degrading treatment committed in the context of the CIA secret rendition, interrogation and detention programmes were closed in 2012, resulting in only a meagre number of criminal charges being brought against low-level operatives. The Committee is concerned that many details of the CIA programmes remain secret, thereby creating barriers to accountability and redress for victims (arts. 2, 6, 7, 9, 10 and 14). The State party should ensure that all cases of unlawful killing, torture or other ill-treatment, unlawful detention or enforced disappearance are effectively, independently and impartially investigated, that perpetrators, including, in particular, persons in positions of command, are prosecuted and sanctioned, and that victims are provided with effective remedies. The responsibility of those who provided legal pretexts for manifestly illegal behavior should also be established. The State party should also consider the full incorporation of the doctrine of “command responsibility” in its criminal law and declassify and make public the report of the Senate Special Committee on Intelligence into the CIA secret detention programme. This lack of accountability is expected to continue, with the one comprehensive official attempt to ascertain the level of U.S. criminality in the war on terror – the Senate’s years-long investigation into CIA torture – studiously avoiding the assignment of culpability for these illegal policies. A soon-to-be released Senate report on the CIA doesn’t assess the responsibility of former President George W. Bush or his top aides for any of the abuses of the agency’s detention and interrogation program, avoiding a full public accounting of one of the darkest chapters of the war on terror. “This report is not about the White House. It’s not about the president. It’s not about criminal liability. It’s about the CIA’s actions or inactions,” said a person familiar with the document, who asked not to be further identified because the executive summary – the only part to that will be made public – still is in the final stages of declassification. The Senate Intelligence Committee report also didn’t examine the responsibility of top Bush administration lawyers in crafting the legal framework that permitted the CIA to use simulated drowning called waterboarding and other interrogation methods widely described as torture, McClatchy has learned. Despite the lack of accountability for those who actually crafted these illegal torture policies, the United States government had the gall to claim in its “periodic report” recently submitted to the UN Committee Against Torture that it is complying fully with the Convention Against Torture (CAT). The government claimed [PDF], “U.S. law provides jurisdiction in a number of ways that could be relied on for criminal prosecution of torture and ill-treatment of detainees” and offered a few examples. The problem is, the Justice Department division the government cited as a bulwark against impunity for torture appears to have prosecuted zero public cases of torture against U.S. officials. So, the government’s periodic report to the UN is basically one lie after another, and for these reasons, it is becoming painfully obvious that the only possibility for accountability may in fact be an international tribunal charged with prosecuting these crimes. Because the U.S. has so consistently flouted its legally binding obligation under the CAT to “take effective legislative, administrative, judicial or other measures to prevent acts of torture in any territory under its jurisdiction” and to “make these offences punishable by appropriate penalties which take into account their grave nature,” it may be up to the international community to help ensure that an officially sanctioned climate of impunity does not take hold in the United States on the issue of torture. Under the terms of the CAT (which the U.S. has ratified), a state party that is not fulfilling its obligations to prosecute torture may be referred to a committee to adjudicate the matter. As the Compliance Campaign has previously noted, it’s high time for this adjudication to take place. If it doesn’t, torture impunity will become even further entrenched, with ominous implications for the whole world. Domestic and international civil society groups are mobilizing a grassroots campaign to urge the State Department and the U.S. Ambassador to the United Nations to stop opposing UN resolutions on depleted uranium in advance of a pivotal vote scheduled next month in the General Assembly. For the fifth time, the Non-Aligned Movement – a global grouping of 120 states not formally aligned with or against any major power bloc – has submitted a resolution on depleted uranium weapons (DU) at the First Committee of the United Nations General Assembly. This year’s resolution contains new language calling for governments to assist countries affected by the weapons. Since 2007, the General Assembly has passed a series of resolutions, backed by the majority of the world’s nations, affirming the need for disclosure of where weapons containing DU have been used, as well as research on the effects of these weapons. 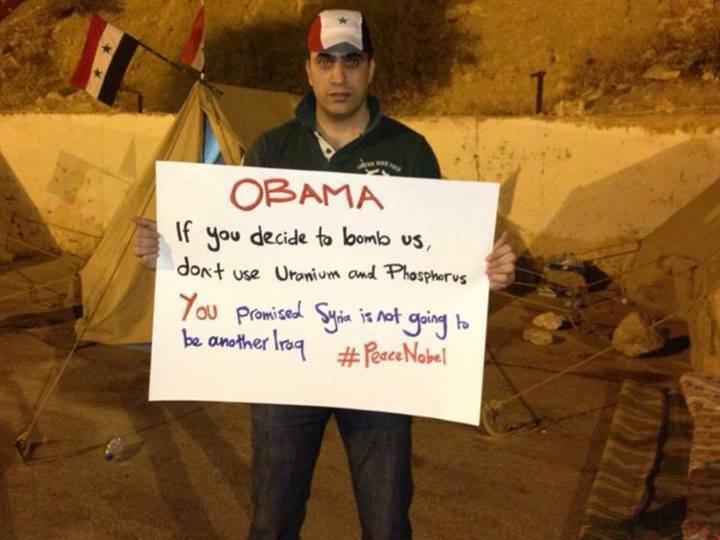 But the U.S. government has consistently opposed these resolutions. Another resolution will be introduced later this month and a vote is scheduled for November 5. Through the Right to Heal Initiative, the New York-based Center for Constitutional Rights is working to raise awareness about skyrocketing rates of cancer and birth defects associated with the U.S. military’s use of DU in Iraq. CCR and Iraq Veterans against the War recently filed a Freedom of Information Act request for the U.S. military’s firing coordinates of depleted uranium weaponry in Iraq – information that is crucial to begin cleaning up toxic areas in Iraq and so that U.S. veterans and service members are aware of possible exposure. 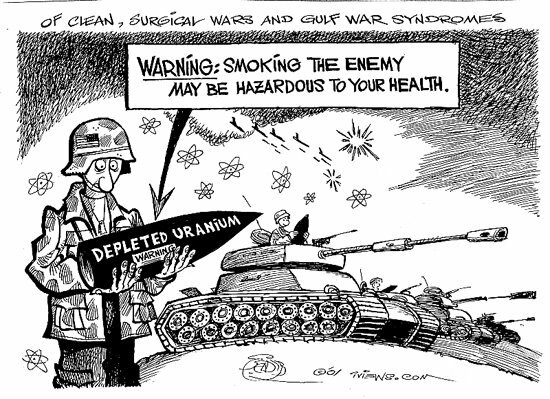 Together with Roots Action, the groups are gathering signatures for a petition to demand that the United States join the rest of the world in its growing concern about use of depleted uranium and end its opposition to U.N. action on this issue. Overwhelming evidence from the peer-reviewed literature now indicates that DU is a carcinogen and can damage DNA. ICBUW argues that it is therefore imperative that those most at risk of harm, such as children living in proximity to contaminated sites, and those most at risk of exposure, such as scrap metal workers are assessed. To date the overwhelming majority of exposure studies have been on military personnel only. Since 2010 the resolution has called for DU users to transfer targeting data to affected states when requested to do so. To date the US has refused to disclose targeting data to Iraq and its failure to do so is a major barrier to clearance and health research. Last month, the US Center for Constitutional Rights and Iraq Veterans Against the War submitted a FOIA request calling for the data to be released. Earlier this summer, Iraq called for help from the international community in dealing with contamination resulting from U.S.-led wars in 1991 and 2003. Two recent reports from the Dutch NGO PAX have documented the problems Iraq has faced in trying manage contaminated sites and material. In Fallujah – which was targeted mercilessly by U.S. forces in 2004 – the use of depleted uranium has led to birth defects in infants 14 times higher than in the Japanese cities targeted by U.S. atomic bombs at close of World War II, Hiroshima and Nagasaki. To add your name to the petition demanding that the U.S. drop its opposition to the UN resolution on depleted uranium, click here.